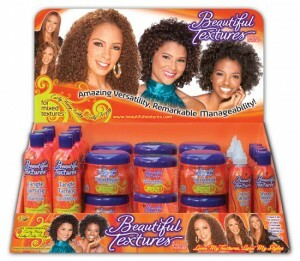 Beautiful Textures has created a new line of hair products for mixed textured hair, and a lucky FAB Girls reader will win some! The products from the line and details on how to enter are after the jump! Subscribe to The Fab Girls blog by clicking the follow button and entering a valid email address. Like the Beautiful Textures page on Facebook here, then leave a comment on the wall about which product you think would be most helpful for your hair and why. Copy that comment and paste it in the comments below. Using random.org, we will chose a comment number, and that entry will win. Winner will be selected February 23. Good luck! Update: Congrats to our commentor Jessica, who wins the Beautiful Textures giveaway! Thanks to everyone who entered. Check back for more giveaways coming up soon! Thanks, Jasmine! Don’t forget to follow the blog by clicking the follow button and entering your email address! Thanks for stopping by! Curly to Straight Flat Iron Silkener because I have a frizz for hair and like to use my striaghtner, but it destroys my hair!! Curly to Straight Flat Iron Silkener looks like a great product, looking forward to trying it. “So excited about these products! I want to try the leave in conditioner, I think it would be great for my 4a/4b hair!” Thank you! Congratulations! You are our winner! Yay! Thanks so much! I looking forward to trying these products! We sent an email to the address you signed up with. Check it out so we can get your shipping info to the company. Congrats, and thanks for your entry! I would love to try the tangle taming shampoo because sometimes my hair is so tangled I don’t even want to wash it – I have to sike myself up to do it.